Hey guys how’s it going, hope all is well. You guys might not recognize me because I don’t really post much on FreeCodeCamp but I do tend to skim through the posts because I enjoy reading stuff related to web development and posts made by soon-to-be or already established devs. I was hoping you guys could take a look at my portfolio and tell me what am I doing wrong. Please review my portfolio…really down at the moment. Looks nice. Any reason for not using a footer? Wish you all the best. Your web pages are very good. When you add more to your latest projects, try and make the div scroll on y axis (overflow-y). Only thing is for the Knob creek the images are a little stretched. How are you applying? What interviewing techniques are you using? I would suggest freelancing (if you have the time) in the background of your teaching job. I’m mostly cold applying and then trying to get in contact with HR through LinkedIn. I’m not the most critical portfolio reviewer, but your portfolio looks solid. Enough to garner interviews if people looked into it for sure. The question is what kind of jobs are you looking for and how are you applying for these jobs? Without answers to those question, it is probably difficult to nail down the problem. There could be no problem, and you just had bad luck. Blind submissions have a low success rate. It is just hard, even for well-qualified people sometimes. Try your best to get your application and resume past the AI and keyword filters with a tool like Jobscan. Tailor your resume to job descriptions will help you get better results. Proofread heavily, spelling/grammar mistakes are very much not tolerated by the recruiters and hiring manager that sifts through what survived the ATS archives. 6 month to a year of job searching through this process is not uncommon, even as you optimize and iterate your resume over this period. An in-depth analysis of the résumé that got me interviews at Google, Facebook, Amazon, Microsoft, Apple, and more. You have a large network of LinkedIn connections, you can utilize that by having them endorse your skills, connect to other currently working developers, recruiters, and hiring managers, and increase your visibility. Also, find and follow companies you are interested in, if you can, write articles with relevant hashtags to your interest area. The most effective way, however, is to have personal connections, because very often they are the best way to get your resume in front of a human being, and if you’re lucky a chance at an actual conversation. Referral from friends or acquaintances often is the leg in the door you need. 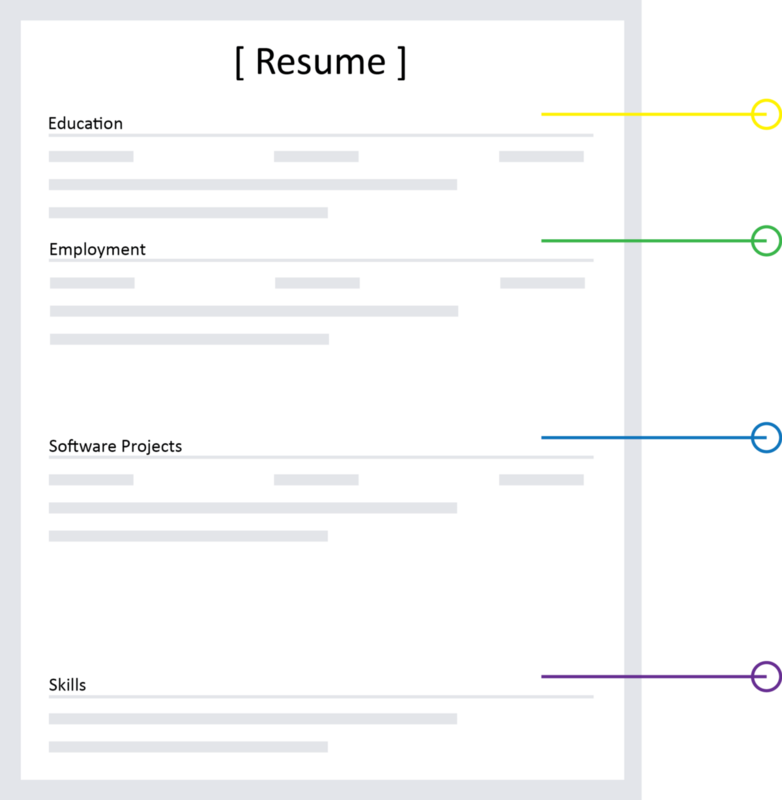 Talk to your friends, colleagues, and classmates, express your interest and see if they have the connection to get your resume an actual look by the devs and hiring managers. You can also forge your own in-person connections. Local code meetups are good places to forge these connections in decent sized cities. If you dare to present a 15 to 30-minute talk on a topic, like say…Redux pattern or CSS Grid, you can garner more opportunities to impress by simply doing a little legwork and demonstrate the ability to organize and communicate clearly. A lot of people that attend those meet up are not only professional developers, but they also are truly passionate and will look past your background and focus on your skills. Have an elevator pitch and practice it, being able to introduce yourself as a competent and passionate coder in about 90 secs can be surprisingly impactful. One of the greatest ironies in my life is that I spent about a year struggling to find direction and jobs in this industry with paltry results, but in the 6-month span that I’ve been working as a dev, I’ve had 3 random conversations with strangers that led to promises to look over my application if I would like to apply. Turns out if you wear a T-shirt that says #CodeLife and goes outside ever so often, sometimes other coders will empathize with the message so much they’d strike up a conversation with you about coding and your coding journey, and sometimes they turned out to be project managers or senior developers of software consulting firms. Put yourself out there and find opportunities to talk shop with other developers as often as you can, at worse you find someone to share your frustration in software development, but sometimes you get an employment opportunity. When it comes to finding jobs, there is luck involved. I wish I had as many work experience as you do. I agree with what the others say, that their advice and don’t give up. Also I think your projects as well as your portfolio page looks amazing. Yeah it has nothing to do with his projects, they look so professional they are inspiring me for my projects. Also I suggest you build more stuff, stuff you enjoy building, and stuff you actually proud of. I think next time when you are in interview you can show those products to the interviewer and if he sees that you are really invested into building all those stuff, I think he will be impressed. At least I will be impressed if I were an interviewer. I love you portfolio, it’s clean and well organized. i just checked your photocatcher project, looks like the css is broken, and getting an error when going to my account page and profile page. To cast a wider net, I’d suggest incorporate the MEAN or MERN stack into your portfolio and skill set which will afford you more interest. Especially as a front-end developer, a modern framework like Angular or React is almost a must have these days. Large Enterprise also heavily relies on Java due to its stability and support, and there are even more jobs available in Java stack because of it, so if you’d like, pick up Spring, Hibernate…Etc. The full stack concepts are really language agnostic, so once you figure out the syntax and tools, it is not that drastic of a transition. I’d also say that you are doing better than most people. You have a job right now. Some take anywhere from 6 months to more than 2-5 years. I wouldn’t kick yourself for not finding something “right out of the gate” honestly. (believe me I do that, and am trying to break that). I don’t think there is any “right” formula on landing a job these days. I see so many different “How to…” and a wide spectrum of advice around the internet… I’m on an email list of some guy who gives lessons/tutorials on how to land a job (very very basic free… then a fee to get more- good for an unemployed job hunter with 0 money lol). The whole 'friends/acquaintances" angle is a hit or miss to be honest- at least for me. In all the years I’ve asked for ‘referrals’ or help with getting my resume to HR… only 2 actually did it. And nothing came out of either but at least I have a name for the next time I find a job matching my skills in that company. In lieu of meetups (there’s a reason why I don’t normally go…or to any job fairs/ “after work” events etc), I joined a slack group- check to see if there is a Web Devs or similar group in your city… good way to get job leads. Thank you guys for all your kind words of support and your impressive feedback! Some of you have suggested that I add some React projects to my portfolio, I’m actually in the middle of building a personal React project so I’m definitely aware of how powerful an impression React makes for any modern web dev. I think your site is fine. I would put the About Me under your resume. you might want to make the text after your position a little darker and more readable. you really need a footer with contact info or something. with your skills, you are not 100% on everything. If you were you would be the best in the world. It makes you look arrogant. I thought your portfolio looked really good man. Im in the same exact boat as you; self-taught MERN stack starting in March and still no luck with an entry job. I feel like getting that entry role will be the hardest part. I believe if you can connect with a person/business that sees potential in people, it will be a good fit.